On pea, Albit is applied as antidote for decrease of side phytotoxic effect of herbicides. In Russia, Albit is officially registered as a plant growth regulator of pea. 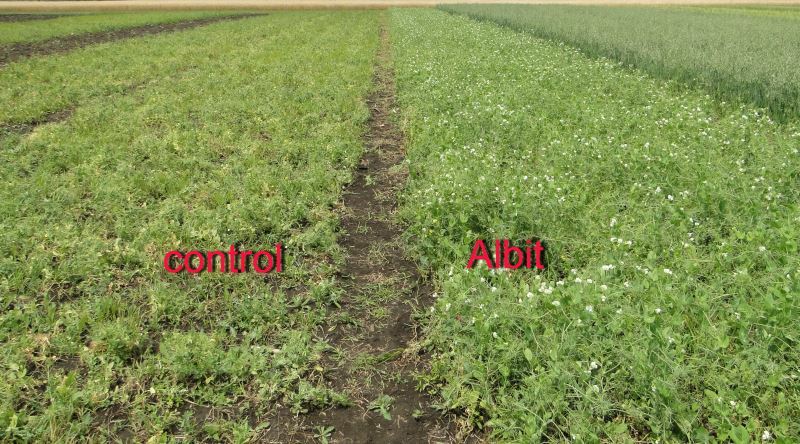 Albit increases field germination capacity, accelerates plant growth and development, improves plant resistance to unfavorable conditions of the environment, provides defense against plant diseases, increases pea yield and improves the yield quality. On pea, Albit has been tested since 2001 in field trials of All-Russia Research Institute of Legumes and Groat Crops (Oryol oblast), All-Russia Institute of Vegetable Selection and Seed Breeding (Moscow oblast) on var. Orlus, Truzhenik, Vega, Orlovchnin, Nord and others. Albit is successfully used on peas in farms of Krasnodar krai, Tatarstan Rebublic, Oryol, Tambov, Vladimir oblasts and also in other institutes and farms. One feed unit of pea contains more than 150 g of digestable protein, whereas other forage crops (maize, barley, oat) contain less amount of digestable protein – 59 g, 70 g, 83 g, respectively (animal nutrition standard – 110-120 g). High nutritious value of pea makes it prospective culture. Treatment with Albit is able to considerably increase yield of pea. For example, in 2015 treatment with Albit increased yield of pea by 1.3 t/ha (30% over control, Agroholding Kornev group). According to results of the trials, treatment with Albit increased pea yield by 0.2 t/ha (12.8% to control). Depending on year, variety and location of field trial, yield increase varied from 0.1 to 0.62 t/ha. Yield of green biomass is also increased averagely by 18.0%. According to results of All-Russia Institute of Vegetable Selection and Seed Breeding, pea gives the highest yield increase in response to Albit treatment among all other tested legume crops (pea, soybean, french bean, lentil, fodder bean, lupine). 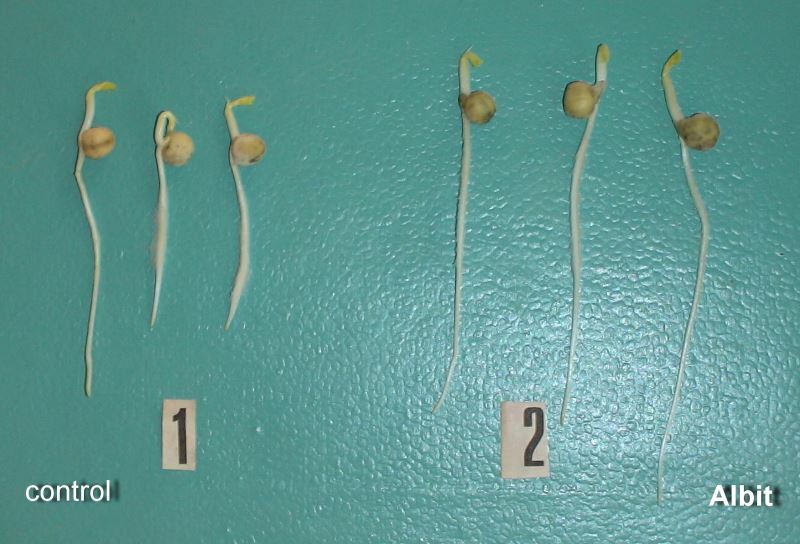 It is necessary to note that presowing seed treatment of pea with Albit is efficient against root rots of different origin (Fusarium spp., Pythium debaryanum Hesse, Rhizoctonia sp. ), which cannot be completely controlled by chemical protectants. The average Biological Efficiency (BE) of Albit against rot rots of pea – 41.4%, maximal BE – 73%. This is equal or even higher than BE of standard chemical protectant. Fungicidal activity of Albit was observed at disease prevalence of 90-100% and disease development of 25-61%. After foliar spraying with Albit, decreased by 50% infestation of leaves by brown rust was observed. Albit not only increases yield and protects against diseases, but also increases field germination, germination energy of pea seeds (Fig. 1), length of shoots and roots, the number of productive nodes, activity of flowering, the number of pods per plant, seeds per plant, decreases accumulation of radionuclides in crop. Application recommendations. It is recommended presowing seed treatment (50 mL/t) and foliar spraying at the budding stage (30 mL/hа, ВBCH 50-60). To decrease infestation of plants with root rots, one presowing treatment is sufficient; extra foliar spraying should be applied to obtain maximal yield. Albit may be applied as antidote in tank mix with herbicides according to their perspective recommendations. Foliar spraying with Albit is recommended to be combined with scheduled insecticide (based on alfa-cipermethrin, dimetoate and others) and herbicide (based on imazamox, bentazone + 2-methyl-4-chlorophenoxyacetic acid and others) treatments to relieve toxical influence of pesticides and obtain increased yield. In these cases, application schedule of Albit can be changed according to recommendations of corresponding pesticides. In the farm Agro-company Kuteminskaya (Tatarstan, 2010), in the conditions of extreme drought (soil temperature was +75°C, air +32°C), peas were treated before planting with tank mixture of Albit (70 mL/ha) + fungicide. 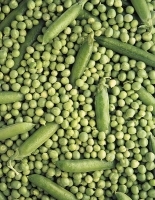 Early ripening of peas was observed in variant with Albit treatment (by 7-10 days earlier than in control). This promoted to harvesting by direct combining. The yield of pea was 1.7 t/ha, the difference with control was 0.51 t/ha. 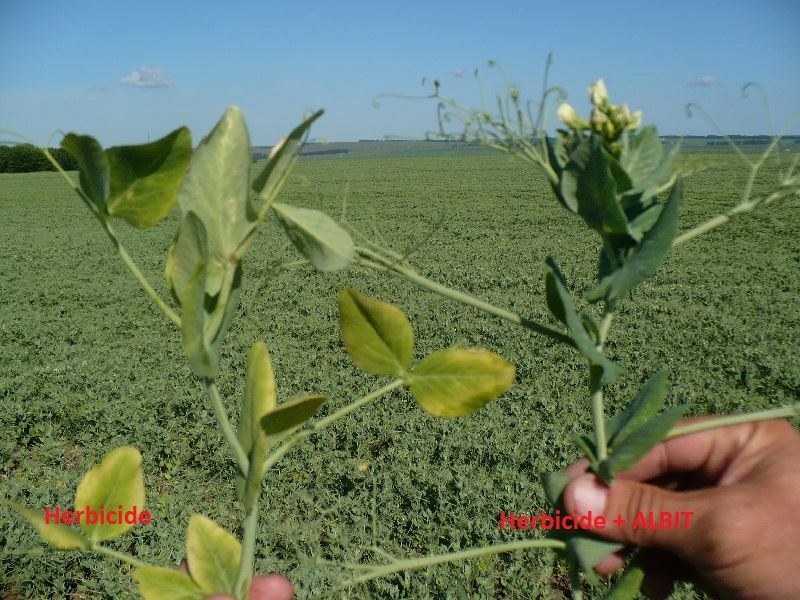 In addition, on a small plot of the field due to a poorly washed sprayer, pea plants obtained herbicide burn and severe stress: yellowing of leaves and general suprssion of plants were observed. Albit application in a dose of 100 mL/ha removed this problem. In 2009, the same incident was observed in Tatarstan Republic. Due to faultiness of sprayers, increased concentration of herbicide (based on imazethapyr + chlorimuron-ethyl) was applied on pea var. Truzhenik. As a result, plants were stressed, their growth was stopped; dropping of tendrils, side shoots, leaves, and also chlorosis and albication of leaves, loss of total turgor were observed. Plants recovered only after Albit application. 3 days after herbicide application, plants were treated with Albit (40 mL/hа). After that, their normal growth was recovered. On photo you can see results of Albit application on pea in Tatarstan Republic (photo was made 1 week after Albit application). Anti-stress effect of Albit is visible on Fig. 2 (top: left – control without Albit treatment, right – field was treated with Albit). On Fig. 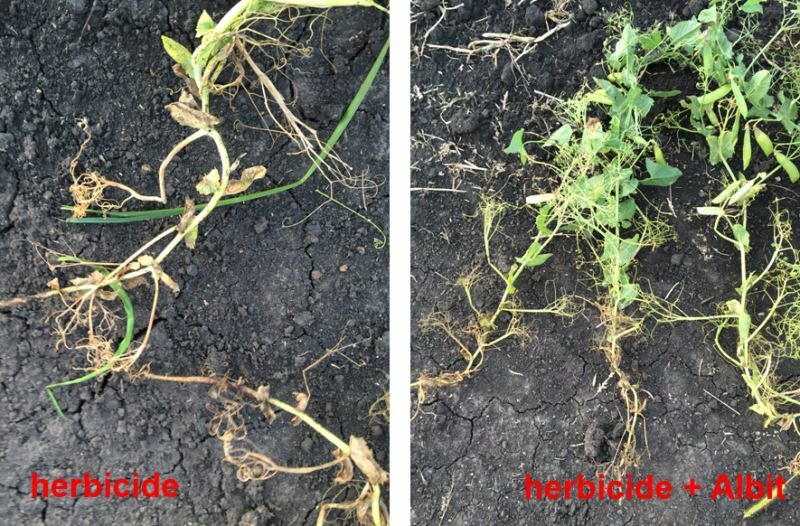 2 (bottom) you can see pea plants (left – control plant damaged by herbicide, right – plant after spraying with Albit). In variant with Albit yield was 2 t/hа. Application of Albit allowed to increase yield of pea by 15%. In fact, it is crop preserved from herbicide stress. In Agroholding Kornev group of Tambov oblast, Albit was applied on pea var. Roket for removing of stress after treatment with herbicide based on imazamox (60 mL/tа for foliar spraying, application rate of working solution 1.2 L/20 hа, 2015, Fig. 3). As a result, yield increase of pea after Albit application was 1.3 t/ha (30%). On pea, Albit demonstrated a high economical efficiency. 1 litre of Albit is applied for treatment of 25 ha and gives extra yield ca. 5.1 tonns of pea. Results of long-term practical application of Albit on green pea in Krasnodar krai confirmed that this culture gives even higher yield increase in response to Albit than fodder pea. Application rates and methods of treatment of green pea are the same, but economical effectiveness of Albit treatments is considerably higher due to high cost of final production.